High harmonic is an increasing problem which affects all power distribution network in industrial, commercial, telecom and medical application. Most of power converting equioments or facilities can generate harmonic current. AXPERT-i-sine is designed with intelligent control algorithm which dynamically changes the switching frequency to optimized the performace & efficency. The performace of AXPERT-i-sine is less affected by supply voltage harmonic distortion. AXPERT-i-sine provides selective harmonic attenuation up to 51st order. Active Harmonic Filter is used to filter harmonics, to avoid their ill-effects on capacitors, transformers, cables, and switchgears etc. Cost of Active harmonic Filters is not that high, if you consider their effectiveness in filtering the harmonics. There are very few manufacturers in India for Active Harmonic Filters and Amtech is one of the leading manufacturers across India. It suppplies Active Harmonic Filter, throughout India. 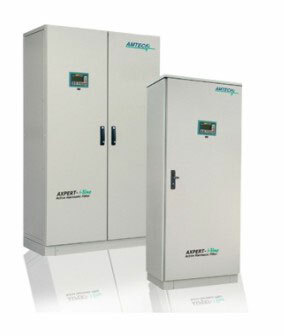 Amtech can also provide Harmonic Free VFD, as it is manufacturing Harmonic Filters.